You are buying the Oratene Pet Maintenance Gel For Cats And Dogs 2.5oz Tube, model #OVMG-2500. ADW Diabetes knows all about the importacne of quality oral health care for pets. That's why we have brought on brands like Oratene as they offer high quality products aimed towards maintaining your pet's oral health. We offer these products in both single and discounted bulk packs for your convenience. ADW Diabetes offers superior service, fast shipping, and offordable pricing on hundreds of pet health care products. 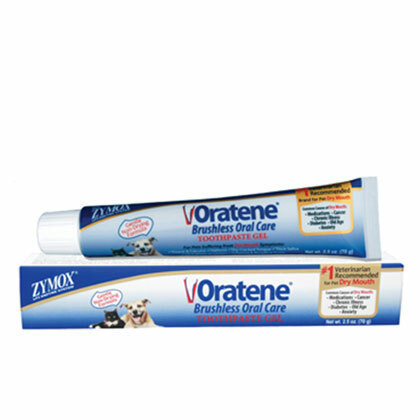 The Oratene Pet Maintenance Gel For Cats And Dogs 2.5oz Tube is also recommended for post care maintenance after a completed course of treatment with Oratene Veterinarian Antiseptic Oral Gel. Apply a 1/2" strip to the upper and lower gums twice a day for maximum effectiveness. 60 day supply in a 2.5 oz. tube. Contains natural Bio-Active Enzymes that effectively inhibit harmful odor-causing bacteria and remove plaque. Clear gel form provides long lasting protection to the teeth and gums. Should be used as part of a pet's daily oral care program. Gentle formulation relieves, soothes and protects. Pets will love the pleasant flavor. Eliminates dryness, irritation, inflammation and redness. Does not contain Xylitol, alcohol, chlorhexidine or chlorine compounds.